Were Pelosi and Delay separated at birth? Should we here at Spellchek feel honored? Apparently, Queen Pelosi reads our blog. No sooner than our Tom Delay post went up highlighting his ridiculous statement concerning cutting government pork than Pelosi essentially said the same thing on a CNN interview Sunday. Mr. DeLay was defending Republicans’ choice to borrow money and add to this year’s expected $331 billion deficit to pay for Hurricane Katrina relief. Some Republicans have said Congress should make cuts in other areas, but Mr. DeLay said that doesn’t seem possible. “My answer to those that want to offset the spending is sure, bring me the offsets, I’ll be glad to do it. But nobody has been able to come up with any yet,” the Texas Republican told reporters at his weekly briefing. Trophies? Spoken like a true establishment hack with no concern for spending your childrens money. Take it to the bank. Mortgage the house and head for Vegas! 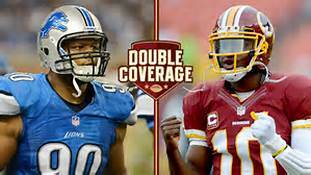 The Detroit Lions have won a road game in Washington, D.C. for the first time in 74 years!!! Delay acquitted – a good day for justice but should conservatives celebrate? Back in 2010, when ex-House Majority Leader Tom DeLay was convicted on money laundering charges related to campaign fundraising, all three network morning and evening news shows made sure to tell their viewers. But last night and this morning, after an appeals court overturned that verdict and completely acquitted DeLay of those charges, none of the broadcast networks bothered to even mentioned the former Republican leader’s exoneration. It’s good that justice was served and the political witchhunt from the left was exposed. Regardless, the majority of America will have no idea due to the bias of the media in this country. Government at peak efficiency? Really, Mr. Delay? No fat left to cut? Gee, I have an idea. Perhaps if you had cut out the fat called Fannie and Freddie under your watch, we wouldn’t have had a financial crash in 2008 caused by the housing bubble. Oh yes Tom, there is always some juicy fat to trim off our spendaholic federal government budget. How would you like to come home and find your house plumbed with beer? As if this would be a problem. Were the Syrian WMD’s supplied by America? President Obama has tentatively agreed upon the framework structure of the agreement between Syria and Russia to overturn Syria’s stockpiles of chemical weapons. Most observers have concluded that this is a major political victory for Russian P.M. Putin for one-upping Obama and showing America to be weak on the global stage. This will likely be debated for a long time to come, however, the agreement gives Syrian leader Bassad the breathing room he needed to continue to try to stay in power. In fact, a Lebanese newspaper is reporting that Assad has already begun transferring his chemical weapon stockpiles out of Syria into Iraq. What’s interesting is that the chemical weapons stockpile Assad now possesses are the very same ones purported to have been under control of Iraq’s Saddam Hussein. You may recall that there was no end to opponents of the Iraq War that reported the transfer of WMD’s out of Iraq prior to the war thus negating any authorization for the war itself. Here are a couple examples. We can back even further to the 1994 Riegle Report which was a Senate report detailing how U.S. companies originally supplied the raw materials to Iraq for the production of the WMD’s. This article examines these accusations in detail including the Riegle Report – http://globalresearch.ca/united-states-exports-of-biological-materials-to-iraq/655. A logical conclusion for the high level of confidence exhibited by the Bush Administration over the existence of the WMD’s in Iraq would be because America itself supplied Hussein with the materials needed. Was Bush aware the WMD’s were moved to Syria before the invasion and proceeded anyway? Certainly a debate topic. Will we see a repeat of this scenario in Syria? Will Obama still attack Syria at some point? Will the WMD’s already be out of Syria and back in Iraq? Time will tell. We’ve all heard of the influence of the military-industrial complex. America producing and selling chemical weapon raw materials and then repeatedly using them for justification for conflict would certainly seem to fit the bill here. None of this justifies Hussein or Assad and their utilization of chemical weapons to kill their own people. Also, none of these accusations of the trail of WMD’s can be reported as irrefutable fact. But it sure smells like a rat when you consider the American blood and treasure lost. One thing we can be reasonably sure of is that it hasn’t ended yet and more loss will be forthcoming concerning the trail of America’s chemical weapons. Did Obama’s al-Qaeda rebel fighters in Syria cross the red line? As part of the Obama administration’s repeated insistence – though without offering proof – that the recent sarin gas attack near Damascus was the work of the Assad regime, the administration has downplayed or denied the possibility that al-Qaida-linked Syrian rebels could produce deadly chemical weapons. You may recall that the Obama red line, which he now claims is the world’s red line, threatened action for everyone, not just Assad. Perhaps Obama will offer the rebels the same deal the Russians offered Assad? Turn over your chemical weapons and the U.S. won’t inflict a tiny little pinprick of a strike. Somehow, I don’t think Barry’s Muslim Brotherhood friends were ever under any threat of a strike, no matter how tiny. American blood and treasure – is it worth the oil and gas? I’ve been a regular reader of Mike Shedlock’s blog for years. It appears Mish is also seeing the connection to energy in Syria. He also posted on the pipeline connection as well. Folks, as Al Gore would say, the debate is over. America’s blood and treasure are being spent on energy. The evidence is everywhere. Now, a legitimate argument can be made that energy supplies and access are not only in our national interests, but our national security interests as well. It’s just that you can’t really sell that to the taxpayers or the moms and dads who see their sons and daughters sacrificed for the cause. So it will continue to be a covert modus operandi. Some statistics for you via the Bureau of Labor Statistics comparing January of 2009 when Barack Obama took office and August of 2013. Total civilian non-institutional population meaning those 16 and older not in prison or the military. We added 11,220,000 million working age people to the rolls. The labor force grew by just 1,770,000 million of the 11,220,000 new additions of working age people. Total employed which only requires working 1 hour per month to be included. How about that! 2,071,000 more employed exceeding the growth in the labor force itself. Which means another statistic must have went down. Here it is! 300,000 less unemployed now compared to January 2009. Wow! President Obama really has reduced the unemployment rate since taking office. Uh-oh! The inconvenient truth. 9,450,000 million more people no longer even in the labor force. They didn’t die. They didn’t win the lottery. They are the gift that keeps on giving to the Obama Administration as they allow for the artificially low unemployment rate numbers to be reported as evidence of an improving economy. Hard to believe that we have more people in the U.S. not in the labor force that exceeds the total populations of countries like France or Germany or the United Kingdom. Forbes has this astonishing story covering a CATO study of welfare recipients. The American public continues to be hoodwinked on Syria. Clearly, the chemical weapons are a diversion. Assad has used them previously so any “red line” talk is bull. The civil war in Syria has resulted in over 100,000 deaths of its citizens so far so any talk of a humanitarian response is bull. Following the money takes you through Qatar and Turkey who will be left out of the pipeline plans. Lets not forget Barry has his own ambitions to promote the Muslim Brotherhood throughout the Middle East. We’re seeing a perfect storm coming together in which our Ideologue-in-Chief can pursue his personal agenda as it aligns with the powerful forces involved with the oil and gas wars. Assad doesn’t stand a chance. Regime change is absolutely coming.